Understanding the future potential of hydroponics as demonstrated by Ripple Farms’ container at Evergreen Brick Works. The last time you visited Evergreen Brick Works did you notice the two-storey shipping container on the west end of the site? Wondered what it was? That container is operated by Evergreen Brick Works’ latest tenant, Ripple Farms. The container is the first of its kind in Canada and could be an answer to food security issues in Canada and abroad. 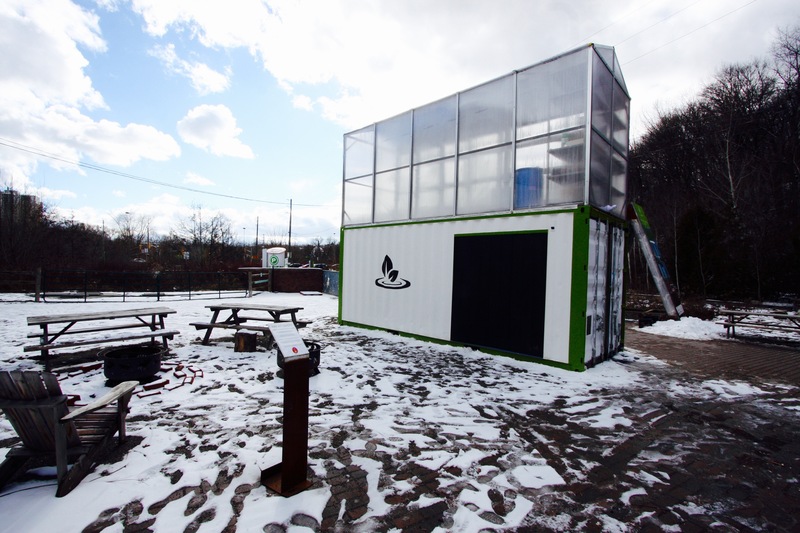 The container houses a system which grows organic chard, lettuce, arugula and basil, among other things. The plants are grown without soil and instead feed on nutrients provided by Ocean-wise certified tilapia excrement. In return, the plants filter the water for the fish, creating a recirculating ecosystem. This vertical farming method has many benefits, including its ability to produce food anywhere in the world regardless of the climate. Along with its versatility, an aquaponics system is innovative in its resource efficiency. While this new method of food production uses more energy than traditional farming, it uses 90% less resources. This is important for communities that lack access to water or other necessary farming resources. While Evergreen Brick Works houses the first structure from Ripple Farms, they are planning to expand to a second, larger facility which could feed over 55,000 people three meals a day for a year. Their goal is to help tackle food security issues in Canada and work with other industry professionals to expand this new method of urban agriculture across the country. Next time you’re at Evergreen Brick Works check out their structure and perhaps visit a workshop to learn how you can create a system like theirs. While Evergreen Brick Works may have been the testing site, expect to see more urban agriculture like this crop up in the near future. Mayor John Tory visiting Ripple Farms in December 2016. Image credit Bill Wilson. Images courtesy of Ripple Farms unless otherwise stated.